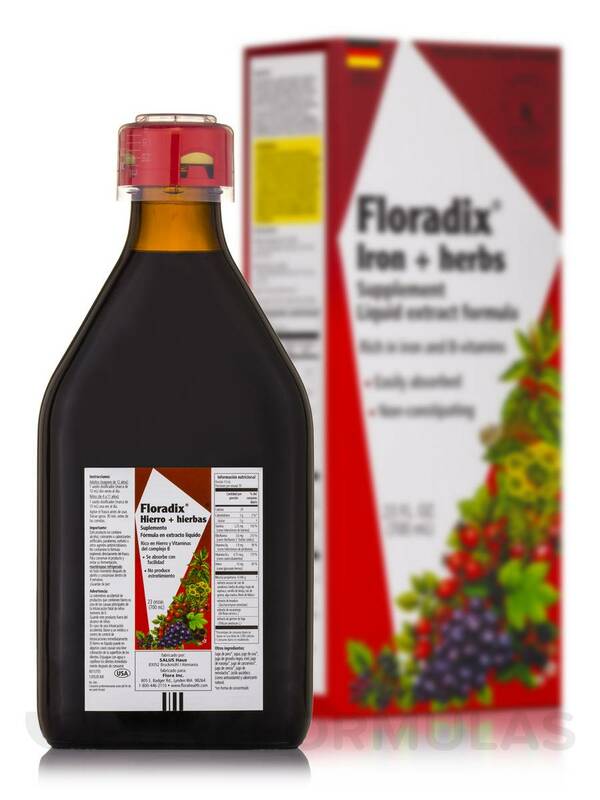 Floradix Iron + Herbs by Flora is a great product at a great price. 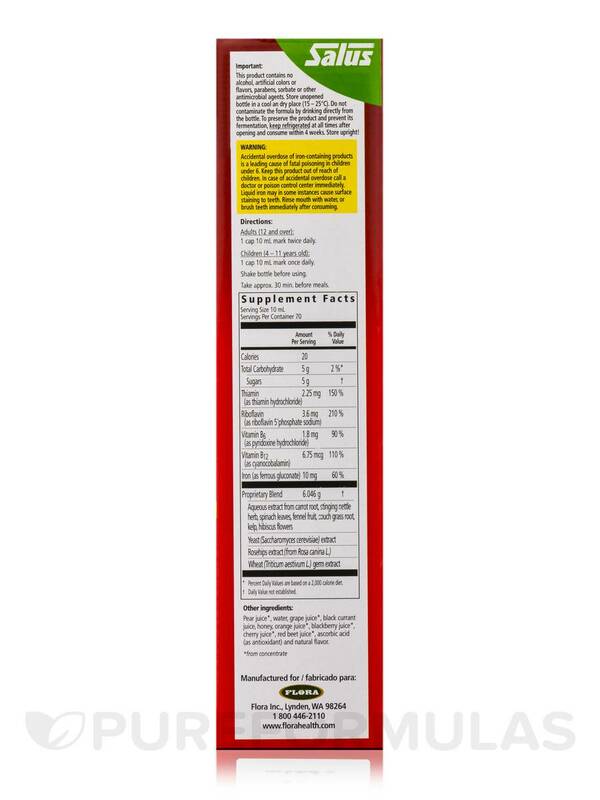 I ordered Floradix Iron + Herbs by Flora for my mom and it corrected her iron deficiency and now am ordering this for my dad. You may be Iron Deficient! Why do so many of us constantly feel tired or fatigued? Perhaps we are one of many suffering from iron deficiency – the single most prevalent nutrient deficiency worldwide. In fact‚ iron deficiency is the leading cause of fatigue among women between the time of menstruation and menopause (it is estimated that up to 26% of reproductive aged women are iron deficient). Adolescents and women of childbearing age need to regularly replace the iron that is eliminated through monthly blood loss. Demand during pregnancy also increases as iron is needed for proper placenta development and prevention of pre-term and low birth weight babies. In children and teenagers‚ a lack of iron is common due to poor eating habits‚ stress and growth spurts‚ and could influence behavior‚ learning ability and overall health. Endurance athletes and those who exercise regularly lose iron through sweat and the digestive tract‚ putting them at risk for deficiency and decreased stamina. Iron is an essential element for the body. It combines with copper and protein to make hemoglobin‚ a major component of red blood cells which transports oxygen from the lungs to all the tissues of the body. Iron is also needed throughout the body for adenosine triphosphate production (ATP). ATP is required for cellular energy and proper cell function. When iron is low‚ ATP production drops and energy levels decrease as a result. INGREDIENTS: Aqueous extract from: carrot‚ nettle wort‚ spinach‚ quitch roots‚ angelica roots‚ fennel‚ ocean kelp‚ African mallow blossom‚ orange peel. Juice concentrates (pear‚ red grape‚ black currant‚ orange‚ blackberry‚ cherry‚ beetroot)‚ yeast extract (saccharomyces cerevisiae)‚ honey‚ rosehip extract‚ wheat germ extract‚ natural flavor. Adults (12 and over): Take two teaspoons of Floradix® Iron + Herbs or Floravital® (half of measuring cap)‚ twice daily before meals. 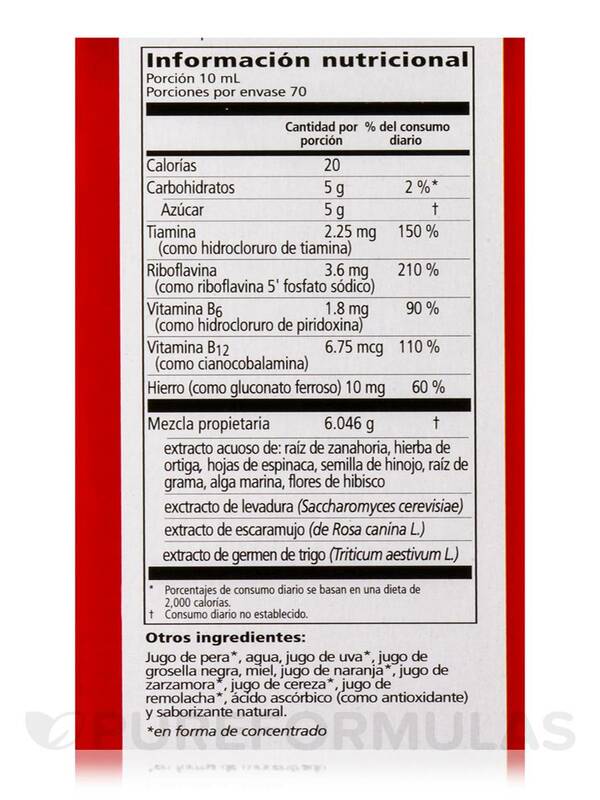 Children (4 – 11 years old): Take two teaspoons (half of measuring cap)‚ once daily before a meal. Iron can be fatal to children if taken in an overdose. 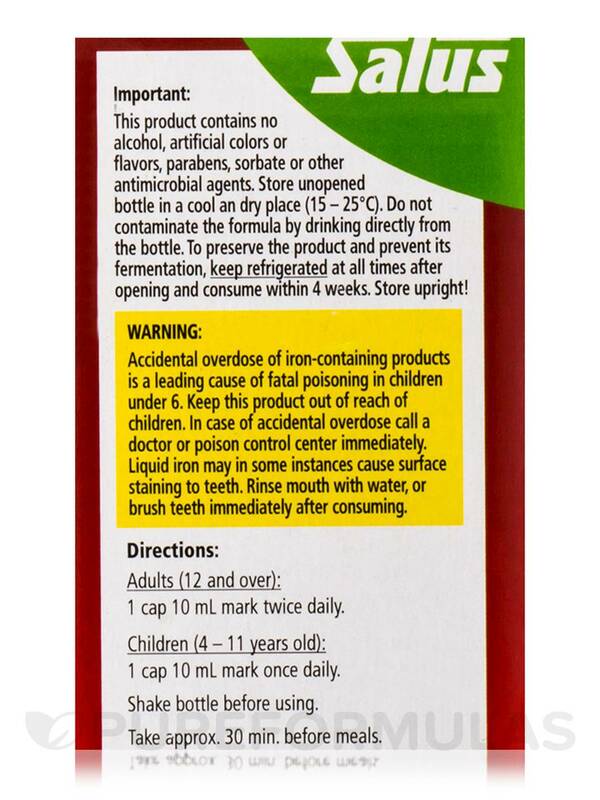 Keep all iron supplement products safely out of reach of children. Do not drink from the bottle! 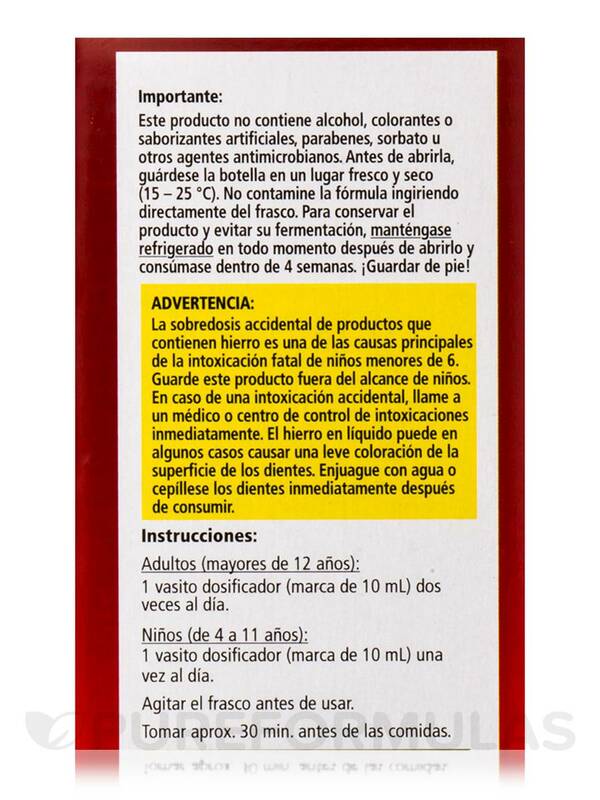 Iron supplements are contraindicated in persons suffering from infections. This product must be used within 4 weeks of opening. Refrigerate after opening. 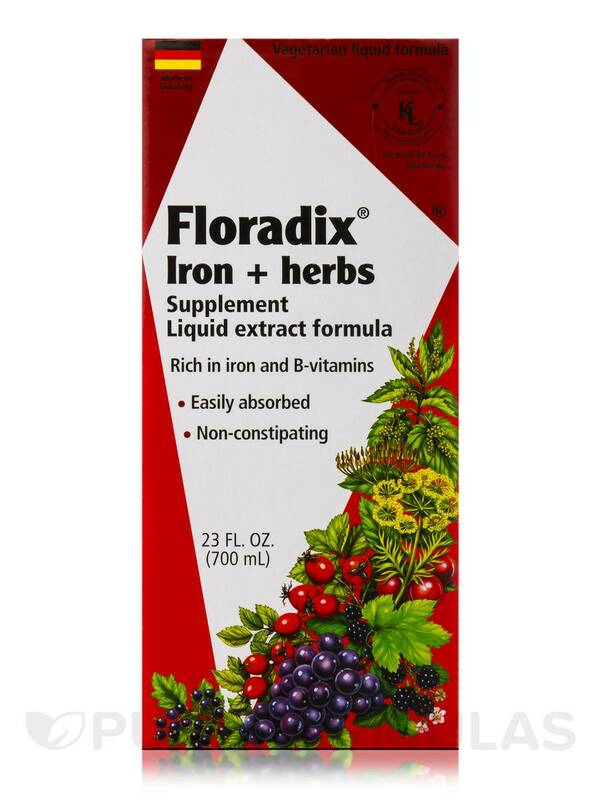 Floradix Iron + Herbs by Flora is a good product that is easily assimilated, but if you are anemic, it is not enough iron to restore your loss. You need to have a blood test that measures hemoglobin and blood feritin levels. If you are really low, you need iron infusions at a clinic. I was severely anemic due to cancer that gobbled up my blood and my iron among other things, and I needed ten sessions to get my blood feritin up to par. 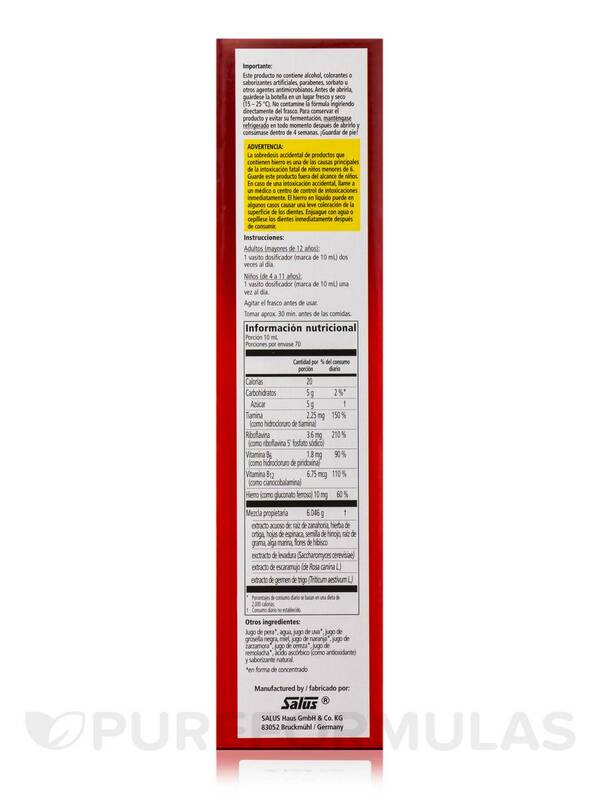 This product is great if you lose some iron every month during your period, but again, get your blood tested to see how low your iron levels are and act accordingly. Good for small iron losses. Not sufficient to restore large losses of iron, which is not a good condition to be in. 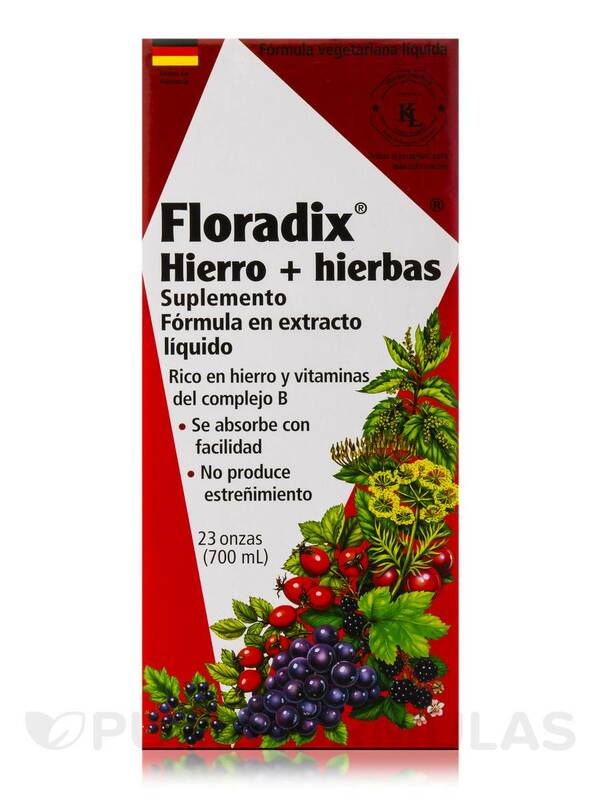 I bought Floradix Iron + Herbs by Flora after my doc checked my iron levels. In fact, she recommended Floradix Iron + Herbs. It tastes good - reminds me of prune juice! I noticed that it does help with my energy level also with a repeat blood test my iron levels did go up a bit. If you put the small cup on too tight over the lid - it can get stuck and its difficult to remove it. Our 4 year old daughter has been on Floradix Iron + Herbs by Flora for just over a year, as she was borderline anemic with CKD diagnosis. Her nephrologist suggested we pick our own iron supplement, and having used Floradix Iron + Herbs during pregnancy, I knew it was a very bioavailable form of iron, so it's the one we picked. The nephrologist had never heard of it, and has been VERY surprised at how quickly her iron levels rose, and that constipation isn't a side effect. We've been thrilled with Floradix Iron + Herbs, and our daughter loves the flavor. I have had anemia since high school. I'm 35 now. At one point in my late 20's I was told I would need a blood transfusion because it was so bad. I never got the transfusion, because that creeped me out in a way. Fast forward to now, age 35. I was always sluggish and tired and cold. Iron pills made me constipated, so I stayed away from them. 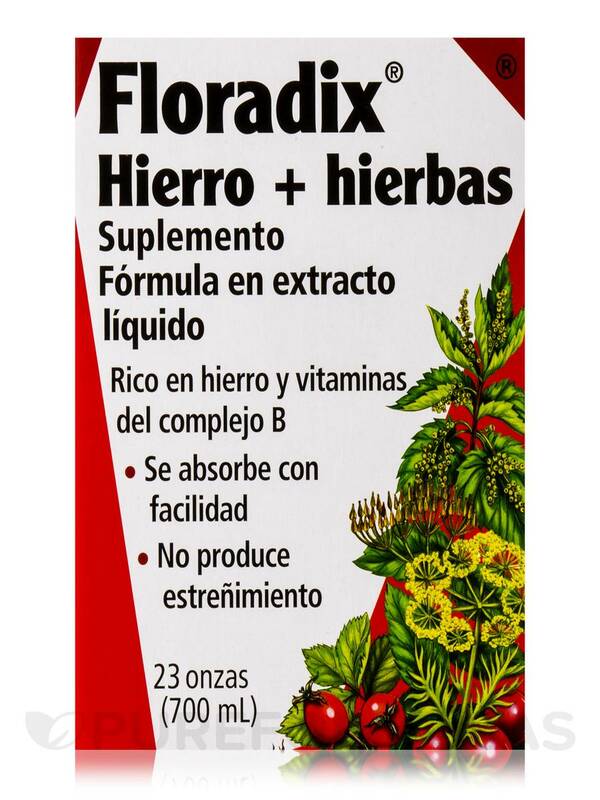 My mother suggested FloraDix Iron + Herbs. Oh ...My...Gosh. Not only am I no longer anemic. I had a blood test, randomly like 4 weeks after I started using FloraDix Iron + Herbs. Not even to check for anemia. But I asked the doctor how it was looking and his response was, "you're not anemic" I was stunned. I will use FloraDix Iron + Herbs forever. My favorite thing about it is that is actually helps me go to the bathroom, rather than stopping me up. Go figure! I'm fixing to of my major complaints with my health with ONE great product!!! EVERYTHING!! It is beneficial and works. Not much. The taste is like licking a wet rusty pipe, but you get used to it. Great product if you have low iron!!! My husband has low iron the doctor gave him a perscription hardly did anything for his iron level but FloraDix Iron + Herbs by Flora works GREAT. His level went from 45 to 66 and it is still going up!!! And he feels better more energy!!! He is 79 years young!!! After recently giving birth to our first child I'd been having trouble getting my hemoglobin level back up. I felt extremely draggy even after multiple naps during the day. My midwife recommended FloraDix to me. I love it! Finally a great iron source without all the side effects! My hemoglobin is headed back up and I can already tell a difference in my energy level after just 4 days of taking the product. Its a great, natural source of iron without all the side effects! And it tastes great too. I ordered FloraDix Iron + Herbs by Flora for more energy for myself and my husband. My grand daughter who is 6 and her family suggested it to us. We have been using it for over a week now and love the results. 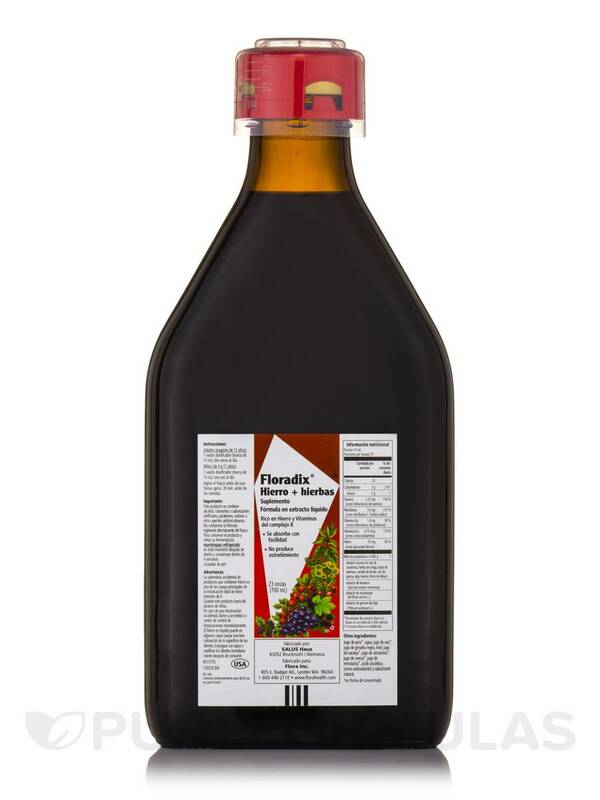 I highly recommend FloraDix Iron + Herbs. Tastes like juice. To me more like orange juice than anything else. Good flavor. Economical size. Included measuring cup is really handy so you can be sure youre taking the right amount. Lid can be over tightened. I did this once and it loosened the seal so it leaked when I shook it up. You just have to be careful not to screw it down too tightly. 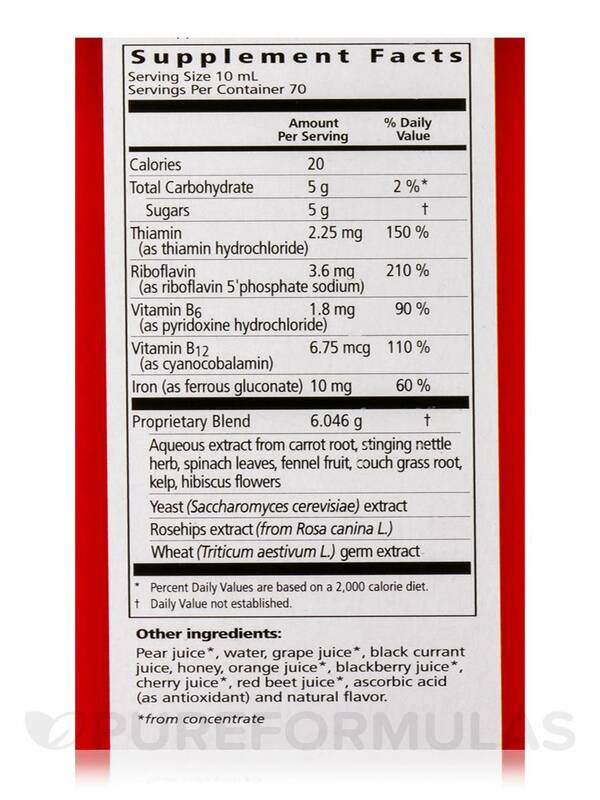 Herbal Iron: Floradix Floradix Iron + Herbs has a Gluten Free Form. 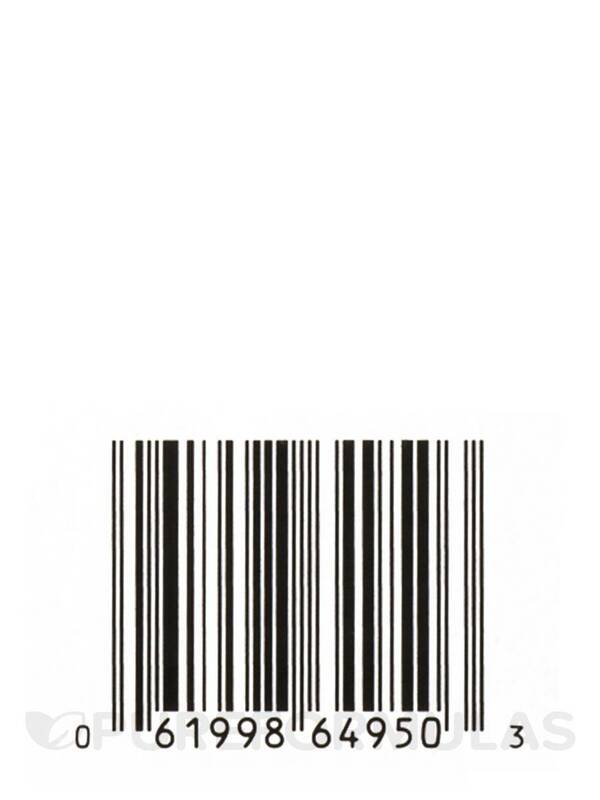 Do you at Pure Formulas sell the Gluten Free form? Are the tabs Gluten Free? Thank you for contacting us Lisa, unfortunately we only carry the above mentioned version.